Our sweet mother Rosemary Williams passed away early Sunday morning February 10, 2019. Rosemary was born September 28, 1923 in Corsicana, Texas to Farley McCarver and Hilda Pollard. She went to school in Dallas, Texas and after high school met and married our dad Edwin Junge in 1942. They were married for 47 years until Ed’s death in 1989. Rosemary’s life was filled with family and friends. She raised our family during the 1950s & 60s caring for her husband and children. During that time she was an Army wife who packed and relocated our family more than a dozen times. She traveled throughout the world and enjoyed new friends, sights and experiences. She proudly raised four independent children, taught us manners and supported us in all our endeavors. She was a comforting consistent woman, you could always count on her for support or advice. Rosemary was an avid gardener who planted flowers in the yard and kept beautiful plants in the house. She even tolerated dad’s fruit trees, vegetable gardens and his messing up the kitchen making sauerkraut, ketchup and Worcestershire sauce. She played bridge, went to exercise classes, enjoyed shopping, knitting, reading thousands of books and volunteering countless hours for causes she cared about. Rosemary was a devoted friend who corresponded with friends around the world, sending out a hundred or more hand written Christmas cards every year. 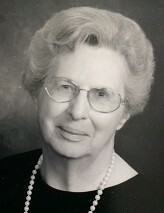 She was a faithful and prayerful Christian woman who held leadership and volunteer positions at Christ Episcopal Church and later St. Thomas Episcopal Church. Rosemary was an excellent cook and never failed to have a hot meal with dessert on the table nightly for Ed and the family. We use many of her recipes today like roasted lamb, fried chicken, cornbread dressing, baked custard or banana nut bread. To the end of her life she loved seeing and hearing about her grandchildren and great grandchildren and she offered advice and guidance. Her door was always open to friends and family. When she grew older she live independently at her own home and then in a retirement community where she met and married her second husband Jay Williams. She was 85 when they married and he was 92. They had three happy years together until Jay’s passing. She was diagnosed with Alzheimer’s in 2010 and the disease caused slow changes over time requiring a need for more intensive care through the years. She was blessed with loving and professional caregivers at Brookdale Glenwood and finally at Brookdale Shawnee where she received exceptional care from Brookdale Hospice the last months of her life. Thank you to friends and clergy at St. Thomas Episcopal Church for faithful support of Rosemary after she could no longer attend church services. Rosemary’s many decades of love and service to others were repaid to her in kind at the end of her life. She is survived by her four children Susan, Nancy (Paul), Jim, and Kathy (Craig); seven grandchildren Tom, James, Jonathan, Jeffrey, Jacob, Alison, and Jessica; nine great grandchildren Samantha, Emily, Lyla, Jackson, Grayson, Evie, Max, Ruby and Shane. She is also survived by her brother, William McCarver, half brother Larry McCarver and many nieces and nephews. She never missed an opportunity to spend time with those she loved. Her long life taught her family to cherish one another, to love one another and never miss the opportunity to have a good time and a good meal together. We take comfort in knowing that she had a long and blessed life and will be missed by all who knew her and have faith we will be with her again. Rosemary will be inurned with Ed at Fort Leavenworth National Cemetery, Leavenworth, KS some warm day this Spring. There will be no other service. The author, Henry Scott-Holland (1847-1918), a priest at St. Paul's Cathedral of London, did not intend it as a poem, it was actually delivered as part of a sermon in 1910. The sermon, titled, "Death the King of Terrors" was preached while the body of King Edward VII was lying in state at Westminster.